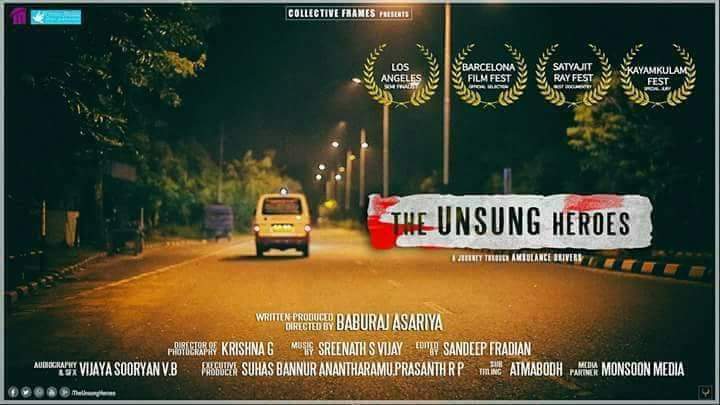 THE UNSUNG HEROES: A Malayalam documentary film that’s winning appreciation and accolades in the most reputed film festival’s. Have you ever witnessed a doctor saying ‘ hank god the patient was brought in time and so he is saved’? In most cases, the credit really belongs to the skilled ambulance drivers who risk their own lives to bring the injured or suffering one for treatment in time and they are the ones whom we often don’t care at don’t even thank. The plot of this documentary, brilliantly narrates the real life scenarios of tireless ambulance drivers who deserves public recognition and it makes people realize what it takes to save a life. Being the semi finalist of Los Angeles and Stiff American Film Festival this documentary is widely appreciated and has already won numerous accolades including the Satyajit Ray Best Documentary Film, Special Jury Award in Prathidwani Qisa Film Festival. Baburaj Asariya also won three awards at the Goa Asian Short Film Festival for best dialogue, best story and best film and Sandeep Fradian also won the best editors award for this movie in the same film festival. Well the list of accolades is not ending here since it Is officially selected for screening at great film festivals around the world like International Film Festival of Barcelona Spain and Belgium an is definitely winning more. READ Why Biju Menon starer Orayiram Kinakalal has the potential to be the unexpected winner this Vishu? This documentary film is a remembrance of the reason behind the many lives saved just because they were in the hospital at the right time. They are ‘The Unsung Heroes’.The hero behind ‘The Unsung Heroes’ is Baburaj Asariya. He penned the story, produced and directed by himself under the banner Collective Frames which was also founded by him. Cinematography was done by Krishna G, Music was done by Sreenath S Vijay, the sound was designed by Vijaya Sooryan VB, Subtitles were given by Atmabodh and its executive producers were Suhas Antharamu and Prasanth Nair.